We had a day off yesterday and spent it on safari in Akagera National Park in Rwanda with our fellow NDI Trainers. We saw all kinds of animals including: a sounder of warthogs, a harem of zebras, a tower of giraffes, a herd of impala, a troop of vervet monkeys, a congress of baboons, two Belgians without a government, a bloat of hippos, a herd of buffalo, Volkswagen Bug sized termite mounds, and much much more. 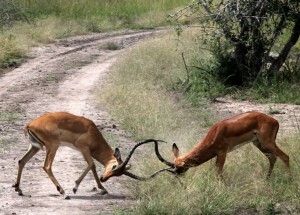 The highlight for me was watching two impala fight for about 15 minutes. One of the impala had offended the honor of the other — pretty typical impala oversensitivity. Their stamina outmatched our patience and we moved on, but, if YouTube is any judge, then not long after we left a crocodile tried to drag one of the impalas into the water and a lion joined in the fun for an animal vs. animal tug-of-war. If you have no idea what I am talking about enjoy the Battle at Kruger. Akagera wasn’t Kruger or the Serengeti, but it definitely didn’t disappoint.